What are the VMI's telling us about three-point shooting in the NBA close to the All Star Break? Keep in mind, as I break some of these numbers down, that the VMI only gauges the physical aspects of shooting. We are left to imagine the psychological impacts associated with watching the opponent hit everything they are shooting, while you or your team starts the game bouncing the ball off the rim. Confidence is crucial in shooting as is; "best focus." Best focus, can come and go based on a number of factors one of which is the defensive player, as all of you know. In the 2017-2018 season, Road Teams shot 36.3% overall from outside the arc. We do not have a breakdown of the VMI’s from that season and the 2018-2019 season has not generated numbers quite as high. At this point in 2019, road teams are shooting about 1% less accurate than last season. Of course, the win % for road teams in basketball is pretty bleak and the “Low VMI” games (where teams are most comfortable—physically) average about 40% winning. Interestingly, in the highest plus VMI range, shooting appears better, but the win percent is very poor. Is this repeatable? Yes, probably, because it points out a couple physical issues. These are teams arriving in Denver and Utah, where they can shoot further, more easily. If they focus well on shooting, then many times it appears they can adjust before the game ends, but their winning suffers most likely from the physiological aspect of becoming exhausted while trying to keep up with the home teams. Both shooting and winning appear to be big issues for the two VMI Ranges which draw closer to the norm for most teams in the NBA. The 12 to 18 VMI range is interesting, because all aspects are the lowest in the league. 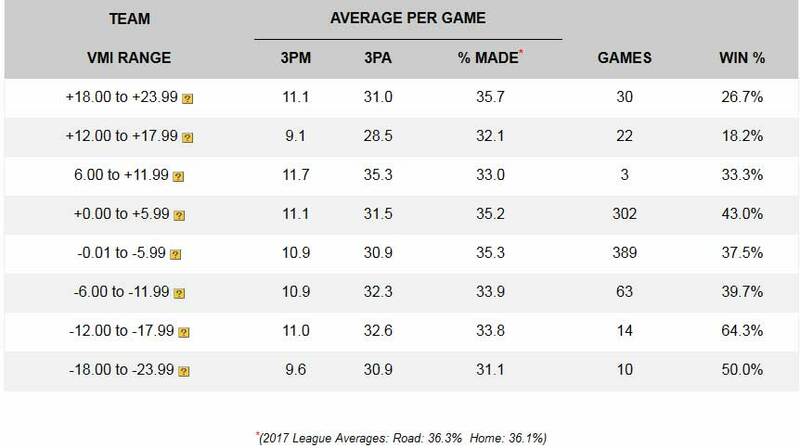 Only 9.1 three-pointers made, attempts down, percent made and percent wins are relatively extremely low. Why? This VMI range identifies three categories of teams. Category 1, are the teams playing their second consecutive road game in a high altitude. Category 2, are the teams first entering Utah from the Mid-West, Oklahoma, Atlanta, or Phoenix. Category 3, are the teams only slightly above 12 VMI that may transition from Utah and Denver to a third road game in Oklahoma, Atlanta, or Phoenix before returning to their home court. As you can imagine, shooting from outside, focus, confidence and keeping the entire game in mind and under control in these transitions, could easily get out-of-hand for a road team. Winning could suffer greatly and this is probably repeatable—each year in the NBA. We have only 3 games played within the “One Inch Long” category of shooting distance. I would probably recommend adding these three games to the 12 to 18 category of VMI for your purposes, and take the "same as above--previous paragraph" approach, until we have more games in this category. The “High Minus” road games are identifying those of Denver and Utah first arriving at a sea level location. The 12 to 18 category identifies teams traveling from Denver to Utah, or from those venues to Oklahoma, Phoenix or Atlanta and probably to Minnesota at 900 feet. The 6 to 12 category is either the second road game, or teams going from the Midwest to sea level. All three categories show poor 3-point shooting, but the win percent in the higher two categories is good. This indicates the big men’s effect on the game of basketball. The higher altitude teams have some pretty good big men in their line-ups this year. We will need to continue watching these numbers, as they are still extremely limited in games played. However, this is what we expected from the beginning, so these numbers are most likely going to repeat each year, especially when the big men are dominant.